Paper recycling may be defined as a range of activities associated with the recovery and processing of scrap paper so that it can be used in the production of new paper products. The first large-scale paper recycling is believed to take place during the World War I in the U.S. In the Second World War, paper recycling once again received a significant boost caused by the need for materials. With the passage of time, the paper recycling rate slowly increased and according to sources, around 75 percent of paper and paperboard mills in the United States use recovered paper in the production of new paper. The same report states that 40 percent of the mills rely only on recycled paper. Nearly all kinds of papers are recyclable. Paper items which are not typically acceptable in collection bins include brown and craft envelopes, carbon paper, paper towels, tissues, candy wrappers, coffee cups, and pizza boxes. Some of the most commonly recycled paper items include cardboard, newsprint and magazines, manuals and booklets, and assorted office papers. Collection: Waste papers are collected from collection bins and deposited in a big recycling container along with the paper collected from other collection bins. So, all kinds of paper go into a single large container. Transportation: All the recovered or collected paper waste then get transported to the paper recycling plant on a collection van or truck. Sorting: After getting transported into recycling plants, papers are sorted into different paper categories such as cardboard, newspapers, newsprint, magazine paper, computer paper etc. as different types of papers are treated differently in the next stages of the process to produce different types of recycled paper products. Making Pulp or Slurry: Pulping involves water and chemicals. In order to pulp the paper, machines first chop it before water and chemicals are added. Then the mixture is heated to break the paper down more quickly into paper fibers. Finally, the mixtures turn into a mushy mix, known as a slurry or pulp. Pulp Screening and Cleaning: To remove contamination from the pulp, the pulp is forced through screens with holes of different sizes and shapes to remove contaminants such as globs of glue and bits of plastic. If the pulp still contains any heavy contaminants such as staples, the pulp may also be spun around in huge cone-shaped cylinders. The cylinders throw the heavy contaminants out of the cone using centripetal force while light contaminants go to the center of the cone and are removed. De-inking: After screening and cleaning come de-inking, which involves removing ink from the paper fibers of the pulp while sticky materials known as “stickies” such as adhesives and glue residue are also separated. De-inking is achieved through a combination of mechanical actions (shredding and the addition of chemicals). Light and small ink particles are removed using water while heavier and larger particles are removed using air bubbles in a process called flotation. Refining, Color Stripping, and Bleaching: In the refining stage, the pulp is beaten to make the paper fibers swell. Beating the pulp also separates individual fibers to facilitate new paper production from the separated fibers. In case coloring is required, color stripping chemicals are added to the fibers to get rid of the dyes from the paper. In this process, brown papers are obtained. When the goal is to produce white recycled paper, the pulp is bleached with oxygen, chlorine dioxide, or hydrogen peroxide to make them brighter or whiter. New Papermaking: In the final stage of the paper recycling process, the cleaned paper pulp is then ready to be used in the production of new paper. Normally, the pulp is blended with virgin wood fibers to provide the new paper with added smoothness and strength. The recycled paper fibers can be used alone as well, however. At this stage, the paper pulp is mixed with chemicals and hot water. The percentage of hot water in the mixture is far greater than that of paper fibers and chemicals. After that, the mixture is fed into the headbox of a papermaking machine and is sprayed in a continuous jet onto a large wire-mesh-like screen moving very fast through the machine. As the water from the mixture starts to drain out, the recycled paper fibers start to bond together to form a watery sheet. Then, the sheet moves quickly through a series of felt-cover press-rollers that squeeze out more water from the paper pulp and it comes out as freshly manufactured paper. The American Forest & Paper Association (AF&PA) AF&PA is the national trade association of forest product industry which represents all the paper-based products producing companies in the country and promotes sustainable U.S. forest products in the international marketplace. The AF&PA members produce around 75 percent of paper-based products in the U.S. Independent Waste Paper Processors Association (IWPPA) Established in 1975, IWPPA is the trade association for companies in the paper product industry in the UK. The association has a total of 80 member companies with a combined yearly turnover of more than £2 billion. The members of the association produce over 2 million tons of recyclate. The Confederation of Paper Industries (CPI) CPI is another trade association for UK paper-based product producers and recyclers with over 70 member companies. CPI member companies have an aggregate yearly turnover of £6.5 billion. European Recovered Paper Association (ERPA) ERPA is a European trade association that represents recovered paper federations of different European countries. The paper recovery and recycling federations from Belgium, France, Germany, Hungary, Italy, Netherlands, Spain, Sweden, Switzerland, the United Kingdom, and Finland are members of ERPA. Paper recycling is a well-established, and capital-intensive industry. Paper recycling can be a useful extension of services for companies that recycle other materials. And at the entrepreneurial level, however, there are opportunities available in the provision of services such as collection, transportation, and sorting. Where in the past, recyclers were likely to remove only a specific recyclable material from a customer, such as pallets or scrap metal, service-oriented recyclers today are increasingly offering to remove several recyclable materials from customers at the same time. Old corrugated cardboard (OCC) is is more frequently being collected as part of dock sweep programs, where a recycler will remove a range of recyclable products from a location at the same time, on the same truck. Such programs are attractive to customers in terms of helping them to remove the materials on a timely basis rather than having to wait to accumulate a full load of a single material. One entrepreneurial activity associated with paper recycling is that of paper shredding. According to insiders, an investment in the $30,000 to $60,000 range would be required to purchase a truck and shredding machine combination. Revenue is derived from businesses requiring confidential shredding services, as well as from selling the shredded paper to the recycling plant. The requirements for recycling paper in the U.S. vary from state to state. Pennsylvania, New Jersey, Rhode Island, Wisconsin and the District of Columbia have all passed laws requiring that all paper grades are recycled. 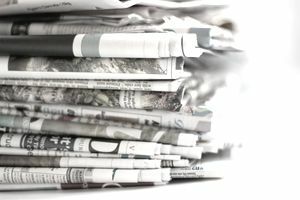 California requires that businesses recycle newspaper. In Connecticut, it is mandatory that all waste generators recycle newspaper, magazines and white and colored office paper while options for recycling telephone books and discarded mail are left to local jurisdictions in that state. Maine, South Dakota, and Virginia have also adopted targeted mandatory paper recycling requirements. The paper recycling rate continues to improve. The industry has been negatively impacted by depressed global prices and challenges associated with contamination during the curbside recycling process. One positive development has been an increase in curbside OCC generation, which is attributed to the growth of e-commerce and home delivery. In fact, the paper is increasingly used more for packaging and less for communication, resulting in an evolving mix of material being generated.